This dish is inspired by an antipasto on the menu of a favorite Philly restaurant; Pesto. 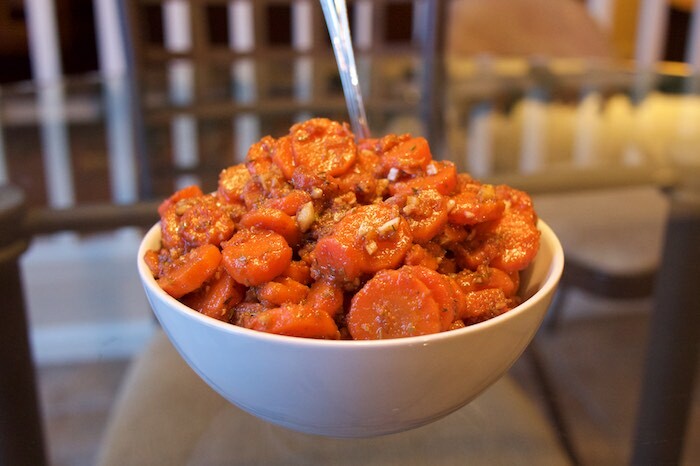 Fresh carrot coins are boiled and left to marinate in a balsamic vinaigrette, laden with oregano & fresh garlic. These carrots are delicious served with Italian bread for swabbing up the marinade. Boil carrots in a large pot of water until tender about 7-9 mins. Strain carrots and while still warm mix with the remaining ingredients. Adjust as needed according to your taste. Refrigerate at least 2 hours. Taste again and add more oregano or vinegar as needed. Sounds delicious! I love carrots. Even better with balsamic and herbs! Wonderful side dish! Cannot wait to try it! This looks fantastic. I love carrots and am always trying to find new things to do with them. Can't wait to try this! I used to hate cooked carrots but once I realized that with flavoring and cooking them al dente how good they were I'm all over them now! Yum! Love oregano and carrots, great combo! This sounds great! I always love the tang of vinegar on veggies, and I don't have many carrot recipes, so thank you! What a great way to serve up carrots! I could make a meal out of those. I adore carrots and herbs. I love anything that requires Italian bread to sop up the sauce. Wow. That sounds so easy. I love restaurant inspired dishes like this, and I especially love cold cooked carrots -- so I can't wait to try this! Love carrots in any shape or flavour, so this is right up my street! When I was a child, I absolutely loved canned carrots. They were so sweet and soft and the coin shape made them even more fun to eat. Today, I no longer eat carrots from a can, nor feed them to my children, but these look like a wonderful (more grown-up) version of carrot coins that I'd be happy to try. Oh, I love the sound of eating this with Italian bread - sounds delicious! My god-daughter loves carrots! I've got to make these for her! I love carrots and these look great! Thanks for sharing! Oh wow these sounds so delicious. I have just baked a lovely fresh baguette and I could really do with some of these carrots to eat it with! I've been having a thing for cooked carrots lately. Adding oregano and balsamic vinegar is a new twist that I'll have to try. Thanks for the recipe. Mmm, balsamic and carrots sounds great! So easy and so totally delicious ! I'm pinning this for later, perfect side dish! What a different take on carrots, so interesting! Wow this sounds great! Such a twist , sounds delicious!